Bertram was the third of 6 siblings born to Alfred Walter and Mary Louisa Lewington, who lived at 23 Cedar Road, St Mary’s. He was born in the first quarter of 1893 and but we are unable to find any further information regarding his childhood. By 1917, at the time of Bertram’s death, records show his parents living at 11 Padwell Road. Eva Mary b. 1888 d. 1971 in Winchester (married 3 times, twice after husband’s death). Alfred Victor b. 1896 d. 26 April 1917 in Amara, Iraq. Walter Ernest b. 1899 d. 1952, aged 53, in Southampton (married Winifred Louisa Fox in 1925). Their daughter Mary W was born in 1926 and their son John W born and died Dec 1929. Records show that Bertram originally enlisted in the 9th (Cyclist) Btn of the Hampshire Regiment. This corps was based in Southampton and he was given the service number 6880. He was soon either voluntarily, or forced, to transfer to the 11th Pioneers. The Pioneers, after much training in the UK and Eire, was finally mobilised in December 1915, landing in Le Havre on the 18th. The next year was spent on the Somme before the commencement of the Battle of Messines in 1917. It is probably in the very early days of this battle that Bertram lost his life. 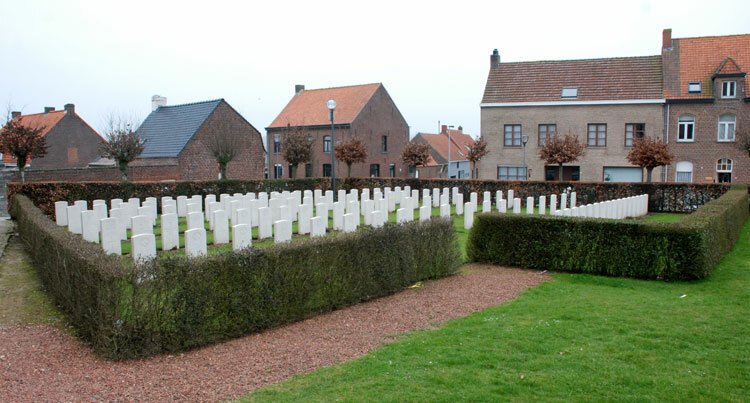 His body was recovered and he was buried in Loker Churchyard nr Ypres (Plot 1, Row C, No. 20). This cemetery is located 6 miles from Ypres and holds 215 casualties. Interestingly, Bertram died on exactly the same day as his second cousin Neville, with Alfred Victor dying 1 week earlier. Bertram is related to three other Lewingtons named on the Cenotaph and Memorial Wall and also memorialised at Southampton Old Cemetery – Alfred Victor was his brother, William Arthur was a cousin, whilst Neville Frank was a second cousin – they all shared the same great-grandfather. Please select the names of Alfred, William and Neville to take you to their stories. I have received the following information from Mark who carried out the research on Bertram George Lewington, and he has emailed the enclosed information and I have copied it for you in case it is helpful. The father of both Bertram George and Alfred Victor was Alfred Walter Lewington (b. 1862 d. ?? )……Alfred Walter’s father was Isaac Charles (b. 1830 d. 1868). Isaac Charles father was Francis (b. 1801 d. 1878)……he is the common link. Neville Frank’s father was Frank Alfred (b. 1860 d. ?? )…….his father was George (b. 1825 d. 1905)…..George was one of Francis’ 6 children. William Arthur’s father was Charles Edward (b. 1858 d. 1931), whose father was Isaac Charles. Just out of interest, Francis’ father was another Francis (b. 1755 d. 1810)….that’s as far back as I went. Hope that sort of makes sense ?! !